In 1889, George Steiner hauled a cart through the streets of Lincoln, Nebraska, delivering clean table linens to downtown restaurants and a new industry was born. Since then, Steiner Corporation—and its original brand, American Linen—has been one of the leaders in what is now called textile services. Moreover, the company has grown to where it currently operates 70 facilities in nearly a dozen countries throughout the world. Since much of this growth came about through the acquisition of other companies in the U.S. and abroad, the 120-year old company found itself challenged to represent its value to the world as a single, powerful entity. 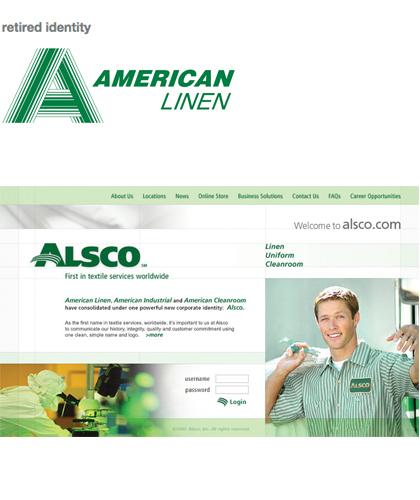 The name “American Linen” had become self-limiting because the company was now global and, too, it now offered a broad range of services beyond linen supply. The project began with both long- and short-term strategic planning, leading to a makeover of the company’s corporate identity, service vehicles, collateral and website. The transformation under the corporate umbrella of “ALSCO” is well under way in North America, South America and Europe.